"On Christmas Eve, Harry went to bed looking forward to the next day for the food and the fun, but not expecting any presents at all. When he woke early next morning, however, the first thing he saw was a small pile of packages at the foot of his bed. 'Happy Christmas,' said Ron sleepily as Harry scrambled out of bed and pulled on his dressing gown. 'What did you expect, turnips?' said Ron..."
Harry's life at Privet Drive seemed to often revolve around Dudley and presents for Dudley. His birthday when he almost throws a tantrum for only getting 36 presents, two less than last year, only to be soothed by his parents who assure him they will buy him more presents that day. Harry of course never received this treatment. However when he first learns he is a wizard, he has just been handed a birthday cake by Hagrid, who then goes on to buy him Hedwig, his owl, as a real birthday present. The wizarding world is full of excess that Harry greatly deserves after his horrible Dursley upbringing; the feasts, piles of gold, more sweets than he can eat, and actual presents at Christmas and Birthdays from people who care about him. This is part one of Harry's Presents, as he receives quite a few gooduns over the seven books, and I want to give them all nice lengthy quotes, because I definitely love reading them and hopefully you don't mind either! Harry felt himself go red. Twenty minutes laters, they left Eeylops Owl Emporium, which has been dark and full of rustling and flickering, jewel-bright eyes. Harry now carried a large cage which held a beautiful snowy owl, fast asleep with her head under her wing. He couldn't stop stammering his thanks, sounding just like Professor Quirrell." "It was wrapped in thick brown paper and scrawled across it was To Harry, from Hagrid. Inside was a roughly cut wooden flute. Hagrid had obviously whittled it himself. Harry blew it- it sounded a bit like an owl." "Harry had torn apart the parcel to find a thick, hand-knitted sweater in emerald green and a large box of home-made fudge. 'That's really nice of her,' said Harry, trying the fudge, which was very tasty." -A large box of Chocolate Frogs from Hermione. "This left only one parcel. Harry picked it up and felt it. It was very light. He unwrapped it. Something fluid and silvery grey went slithering to the floor, where it lay in gleaming folds. Ron gasped. 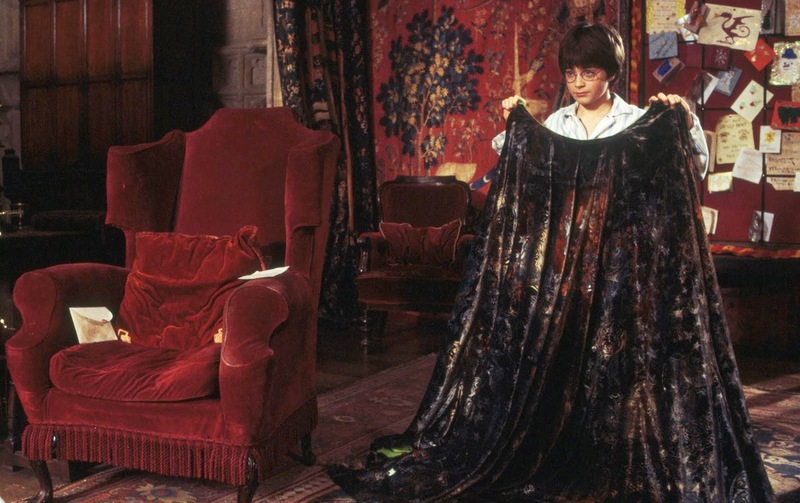 'It'a an Invisibility Cloak,' said Ron, a look of awe on his face. 'I'm sure it is- try it on.'" 'It's not a stoat sandwich, is it?' said Harry anxiously and at last Hagrid gave a weak chuckle. It seemed to be a handsome, leather-covered book. Harry opened it curiously. It was full of wizard photographs. Smiling and waving at him from every page were his mother and father. Harry couldn't speak, but Hagrid understood." "Hagrid had sent him a large tin of treacle fudge, which Harry decided to soften by the fire before eating; Ron had given him a book called Flying with the Canons, a book of interesting facts about his favourite Quidditch team; Hermione had bought him a luxury eagle-feather quill. Harry opened the last present to find a new, hand-knitted jumper from Mrs Weasley, and a large plum cake." Harry- this is a Pocket Sneakoscope. If there's someone untrustworthy around, it's supposed to light up and spin. Bill say it's rubbish sold for wizard tourists and isn't reliable, because it kept lighting up at dinner last night. But he didn't realise Fred and George had put beetles in his soup.Bye- Ron"
"Harry laughed again as he put Hermione's letter aside and picked up her present. It was very heavy. Knowing Hermione, he was sure it would be a large book full of very difficult spells- but it wasn't. His heart gave a huge bound as he ripped back the paper and saw a sleek black leather case with silver words stamped across it: Broomstick Servicing Kit. 'Wow, Hermione!' Harry whispered, unzipping the case to look inside. There was a large jar of Fleetwood's High-Finish Handle Polish, a pair of gleaming silver Tail-Twig Clippers, a tiny brass compass to clip onto your broom for long journeys, and a Handbook of Do-it-Yourself Broomcare." "He recognised the untidy scrawl on the brown paper at once: this was from Hagrid, the Hogwarts gamekeeper. He tore off the top layer of paper and glimpsed something green and leathery, but before he could unwrap it properly, and parcel gave a strange quiver, and whatever was inside it snapped loudly- as though it had jaws." "He nodded towards an empty classroom to the left of the one-eyed statue. Harry followed Fred and George inside. George closed the door quietly and then turned, beaming, to look at Harry. 'Early Christmas present for you, Harry,' he said. 'This, Harry, is the secret of our success,' said George, patting the parchment fondly." "Mrs Weasley had sent him a scarlet jumper with the Gryffindor lion knitted on the front, also a dozen home-baked mince pies, some Christmas cake and a box of nut brittle. As he moved all these things aside, he saw a long, thing package lying underneath. 'What's that?' said Ron, looking over, a freshly unwrapped pair of maroon socks in his hand. 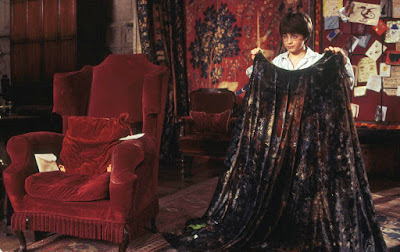 Harry ripped the parcel open and gasped as a magnificent, gleaming broomstick rolled out onto his bedspread. Ron dropped his rocks and jumped off his bed for a closer look. 'I don't believe it,' he said hoarsely. It was a Firebolt, identical to the dream broom Harry had gone to see every day in Diagon Alley." I'll leave it there for now! Lots of good Dobby presents coming up in Goblet of Fire and many more Mrs Weasley sweaters too! I hope you enjoyed this first Harry's Presents post, and if you want more Harry based blog posts, have a look at Best Harry Potter Food and Feasts and Harry Potter Ice Cream Moments.